Fuerteventura’s 150 km long coastline, white sandy beaches, and majestic waves make it the best place for sun, sand, and sea activities in Europe. Declared as a UNESCO Biosphere Reserve, the geologic formations and ecosystems on the island are also wondrous sights to behold. The charm of the oldest island in the Canaries isn’t limited to its beaches. Cultural trips, hiking, trekking, gastronomic excursions, and nature-tripping are just some of the things that await tourists. Needless to say, it’s a holiday destination no one will ever forget. In Fuerteventura, to say “there is a beach for everyone” is an understatement. Start in the northeast at the fine white sand of Corralejo Beach opposite the world-famous shape-shifting Dunes of Corralejo Natural Park. The popular 11 km shoreline has sections for families and even for naturists. If the choice is a quieter and more private haven, indulge at the tranquil waters and white sand of La Concha Beach in El Cotillo. Or venture into the south through mountainous dirt tracks that lead to Playa de Cofete. This 12-km virgin beach is quite remote and deserted, framed against stark black cliffs and the imposing mountains of Jandia Natural Park. Meanwhile, the most dramatic seascape lies at the foot of a small fishing village west of the island, at Playa de Ajuy. Protected by the stunning Ajuy caves, the beach sports black volcanic sand, the beauty of which magnifies as the sun kisses the horizon. Fuerteventura’s remarkable beaches are the perfect backdrop for various water sports. For those who want to go underwater, scuba diving and snorkeling schools are located at Corralejo. Dive centers are also found in Pajara and Morro del Jable. At Sotavento Beach in the south, the waters easily get packed with surfers, kite surfers, and windsurfers. Here, the waves regularly dance to the rhythm of the trade winds, inviting every brave soul to dance along. Surf and kite schools abound in Corralejo and El Cotillo. In the same towns, as well as in Caleta de Fuste, guests get a scenic view of the island while on a boat tour or sailing trips. 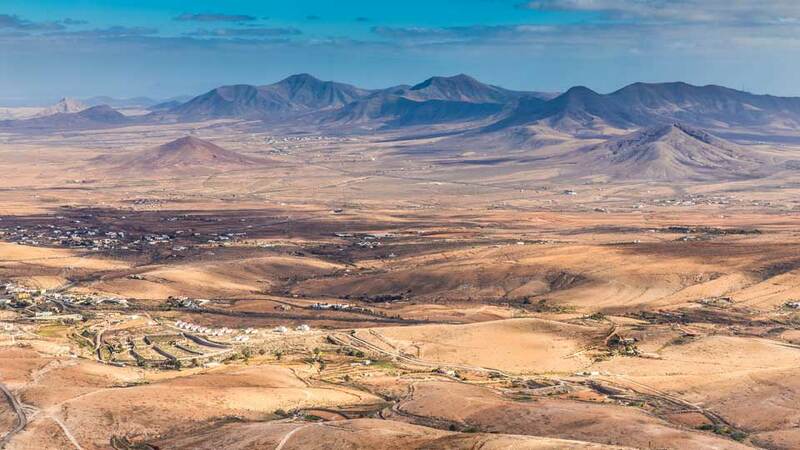 Tourists travel back in time as they visit Betancuria, the first capital of Fuerteventura, in the heartland of the north. Revisit the legacy of religious buildings, such as the eerie Franciscan convent of San Buenaventura and the imposing Santa Maria de la Concepcion Church. A quick trip to La Oliva, the second capital of the island, gives travelers another glimpse into the island’s past. Simply walk around the old Colonel’s 18th-century House and marvel at the traditional whitewashed Canarian houses. Meanwhile, the old Faro lighthouse at the once sleepy fishing village of Morro del Jable offers a breathtaking view of the Atlantic Ocean. To complete a culture trip, make sure to get a taste of the famous local Majorero cheese. 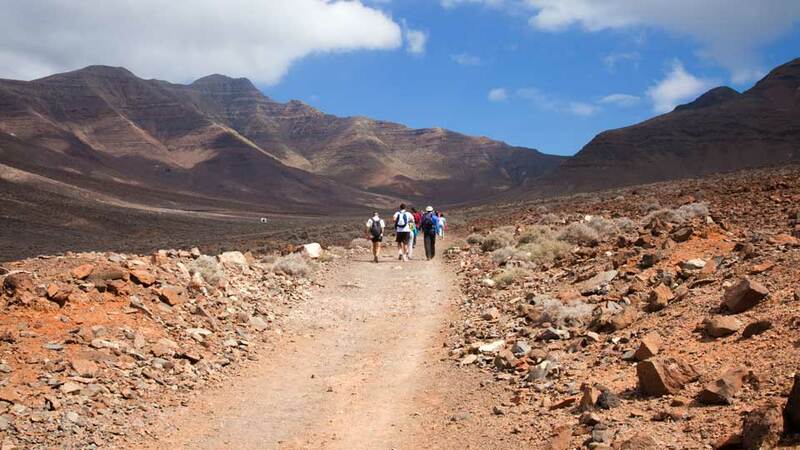 Amidst the arid soils and extinct volcanoes is a fair share of extraordinary hiking and trekking destinations in Fuerteventura. Discover the beauty of Isla de Lobos just off the coast of Corralejo in the north. Also popular are the “badlands” of the Jandia Peninsula in the south. These trails are a great way to explore the endemic flora and fauna found on the unspoiled island. Those who love trekking will also delight in the Ajuy caves. Believed to have been used by pirates who attacked the island long ago, every trek is rewarded by a relaxing dip in the nearby beach. Fuerteventura is a hit among families who want to spend a lovely time away from the harsh European winter. As such, the island offers wholesome recreational activities for all ages. For instance, there’s no better place to see a fantastic 360-degree view and learn about the island’s volcanic past than in Mirador Morro Velosa. To treat the kids to an exciting encounter with wild animals and a plethora of plant species, visit Oasis Park Fuerteventura in Pajara. Or take a plunge in one of the winding slides at Acusa Water Park for a fun-filled afternoon.